Few lures are more exciting to fish than topwater lures, and when it comes to topwater lures, mouse imitators are among the most popular. From muskie to trout, anglers can catch a variety of fish species using a topwater mouse. 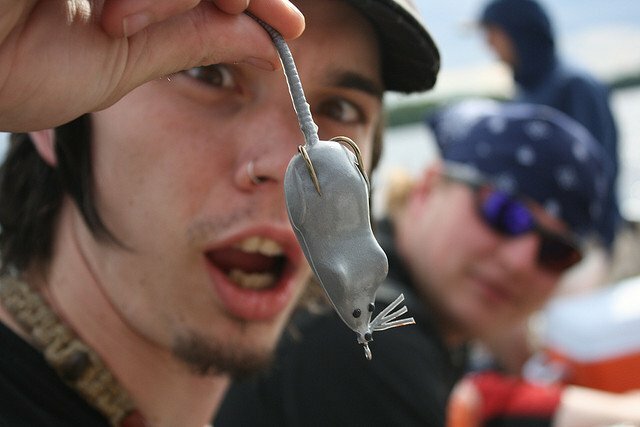 While these small rodents are not as commonly preyed upon as worms, minnows, or crawfish, a number of gamefish feed on rats, voles, moles, and mice whenever they get the opportunity, making the topwater mouse a must-have lure in your tackle box. There are dozens of mouse/rat lures available today. Most are made of soft plastic and come in both solid and hollow bodied models. Furthermore, they’re nearly always weedless, just like topwater frogs. Most feature double hooks that curve upward and rest on the mouse’s back, like LiveTarget’s Field Mouse. This allows you to work them in congested areas like timber, lily pads, and weed beds without worrying about snagging. I always start out with a slow and steady presentation when I’m throwing a topwater mouse. I fact, when I’m working the slowly, I don’t even crank the reel by the handle grip. Instead, I’ll retrieve the mouse by using my thumb and forefinger to turn the handle where it meets the reel body, just like slowly turning up the volume knob on your car radio. This makes the lure creep along and imitate a mouse slowly crawling over the cover. If that doesn’t produce, then it’s time to move to a more erratic, speedier retrieve. The important thing is to pay attention to what the fish want on a given day. While fish will blow up cover to annihilate a topwater mouse, it’s smart to spend a few extra seconds on the openings and pockets within the vegetation, too. Bass and pike are ambush predators, and they’ll often hold in these spots waiting for prey to swim by. Inch your mouse up to these openings and then slowly twitch it across them to entice a bass to strike. Logs that hang out over the water are also great places to try, especially if you’re accurate enough to cast the mouse into the log and then pull it into the water. This same approach can be used to cast the mouse onto shore and then pull it to the water. Like any topwater lure, a setting the hook with a mouse requires a rod with some backbone, as well as strong line, since you’ll be working around thick cover. Many anglers miss out on hook sets with topwater lures because they set the hook too soon, pulling the mouse away before the fish even has it in its mouth. I know it’s hard to resist, but the best bet is to not set the hook immediately; wait until you see the mouse disappear and feel the fish’s weight, then pull back hard! If a fish strikes and misses, don’t immediately reel in the lure. Instead, let it sit motionless for a minute, and then give it a little twitch. 9 times out of 10, that same fish will think it’s wounded the mouse, and it will return for another shot at its dinner.